Yesterday we moved a large Montana 5th wheel trailer from Camping Cabopino, near Marbella to the Marjal Costa Blanca site. The most difficult part of the trip was getting the fifth wheel off the pitch. It had been there a while and the wheels had sank into the ground a little. 4x4 and low ratio, a little rocking and out she came. We used the V10 6.8L Ford F350, which incidentally is for sale. The journey includes crossing some mountains and a steep 25 km climb that slows trucks down to 30 kmh. The F350 coped admirably with the heavy 5th wheel on the back, punching up the hills at 80+ and cruising at a steady 90kmh. 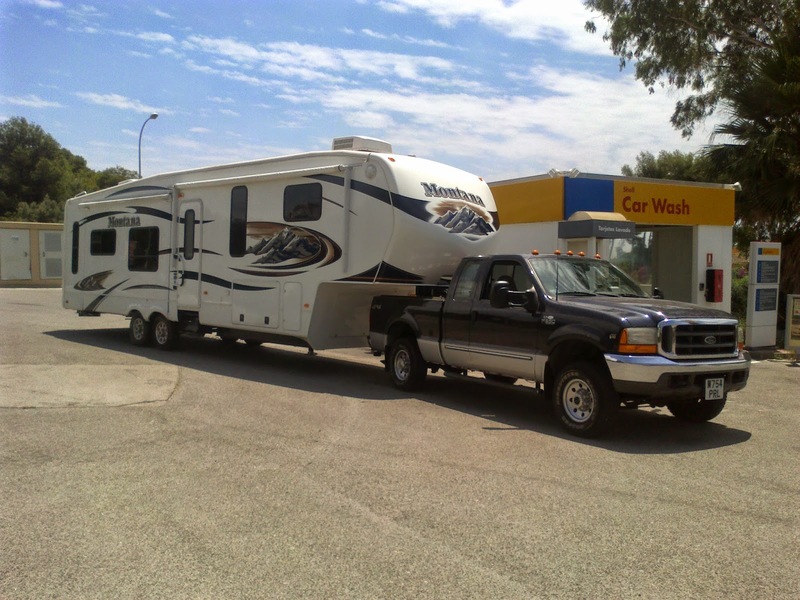 Six hours later 5th wheel was delivered to Camping Marjal Costa Blanca it was set up on the sales pitch and is currently for sale. The Montana 5th wheels are lovely trailers and a joy to tow and have been the best selling fifth wheel in North America for 11 consecutive years! If you would like your 5th wheel or travel trailer moving, for delivery and transport we are the No1 in Europe.